It’s eleven hours straight down the world on a night flight from London to Lusaka. There’s no jet lag but you need a bit of luck with getting some kip on the way. Screaming babies don’t help. Immigration takes a long while – a small number of officials writing out visas by hand in return for $50. The local currency is Kwacha, and we immediately need to visit the cash point to pay an internal departure tax and excess baggage on a short one-hour flight to Mfuwe. 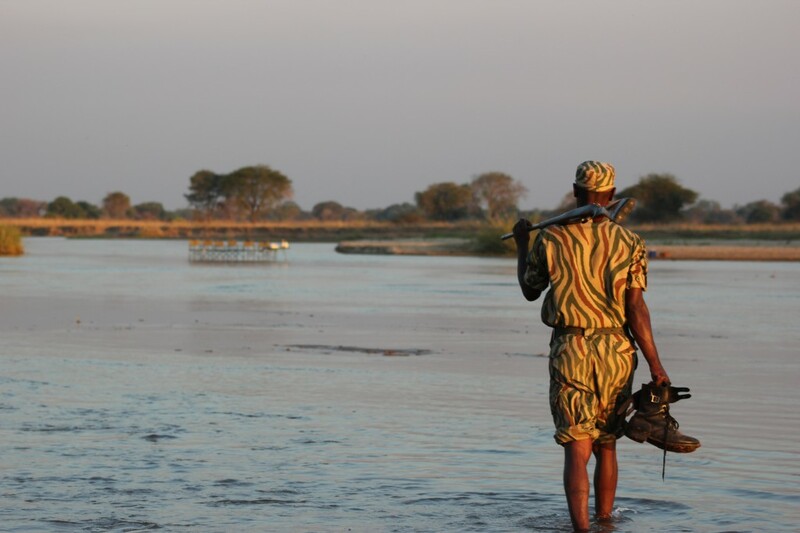 We are heading east to the South Luangwa National Park, home of Nkwali camp., which is charmingly set on the bend of the crocodile and hippo infested Luangwe river. The place is teeming with wildlife, and we embark straightaway on a safari drive that takes in a young leopard sidling through the long, dry grass, a pair of lions, sleeping after a sustained mating session, a brown snake eagle dive-bombing and eating a spitting cobra, scores of elephants, the unique local Thornicroft’s giraffe, and a rather cheeky white-tailed mongoose. Animal encounters continue thick and fast : a dozen zebra in a row drinking at a bright green waterhole; eighteen giraffe gathering around a giraffe carcass in a scene reminiscent of a funeral service; a harrier hawk displaying by changing its face from yellow to red; a heard of elephants crossing the river in single file with the youngsters in the middle; bushbuck, waterbuck, grumpy hippos bellowing, and an ingenious river crossing by pontoon, in which two lads pull the platform to get our jeep safely over. Throw in a herd of buffalo grazing in the low sun, some baboons barking out alarm calls alerting us to the presence of a leopard, and it’s high time for a sundowner gin and tonic overlooking the river. 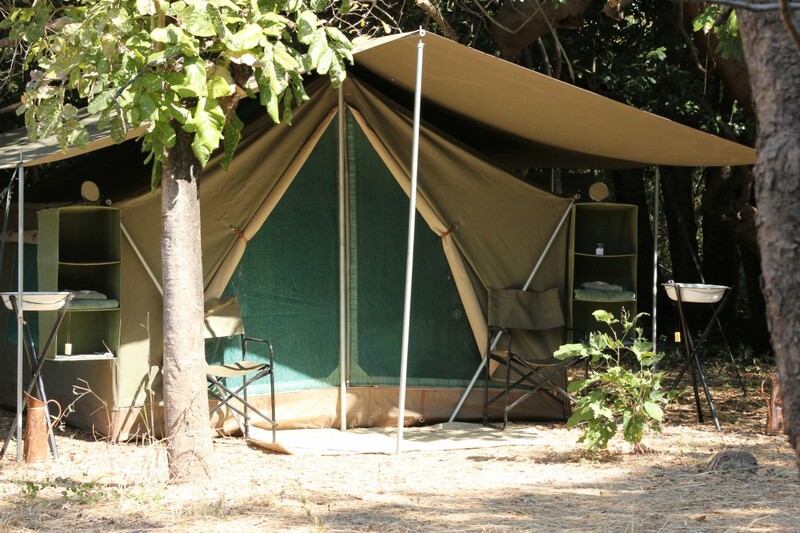 Sleeping in bush camps and lodges requires a broad mind, and it doesn’t pay to be permanently panic stricken. 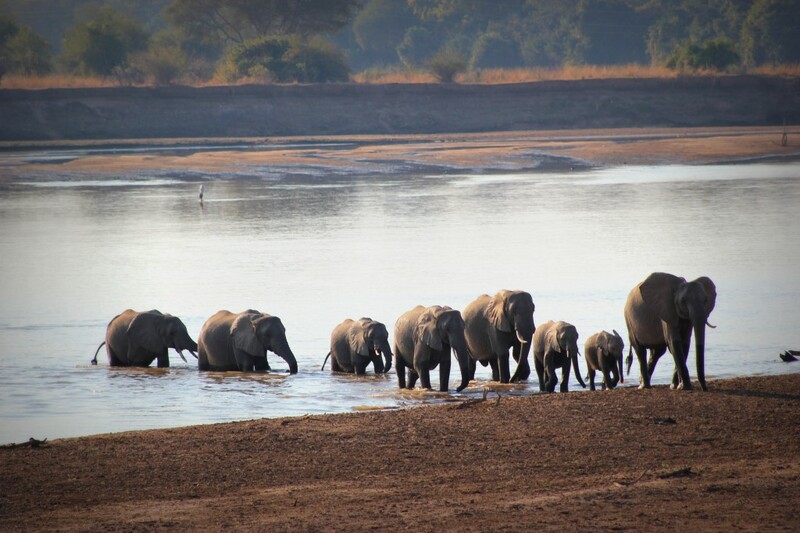 Elephants periodically enter camp overnight and rip up all the trees. This can be unnerving if you wake with a start and wonder what is going on. When Nkwali camp introduced furry hot water bottles as a surprise part of the evening turndown service, one guest assumed the warm lump in the bed was an undesired animal and beat ‘it’ to death with a torch. The soaked bed was a write-off and the hot water bottle design was duly removed. Sunrise over the river on safari is always a joy, even though it’s 5.30 in the morning. We are now off to go mobile – five nights walking in the bush with a brilliant team who pack the camp into a truck every night and recreate it at the next spot when you have finished walking. 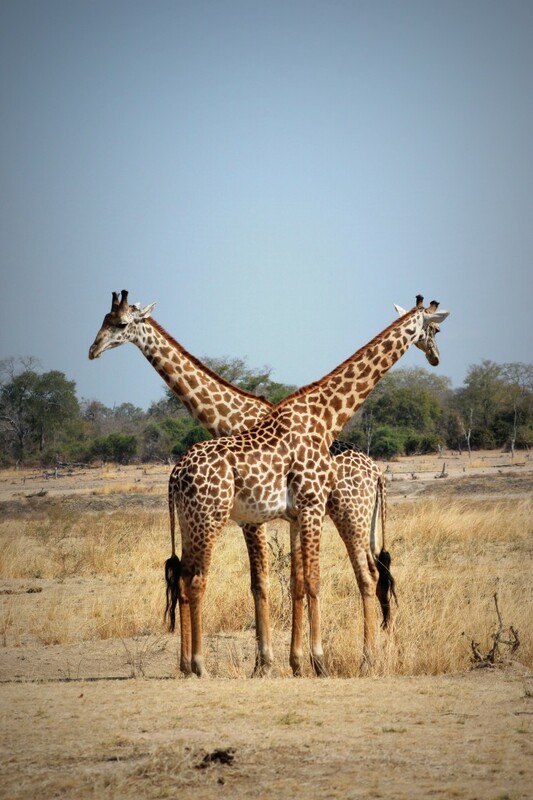 This is the invention of Robin Pope safaris. It involves a 5-hour drive north through Tsetse fly infested country. They give a nasty bite but here they don’t carry disease. They are motion activated, and attack the jeep persistently, leading to a sustained swatting session. We picnic on the way at a pan, where we stop to observe reedbuck, waterbuck, and a huge martial eagle demolishing a lizard. 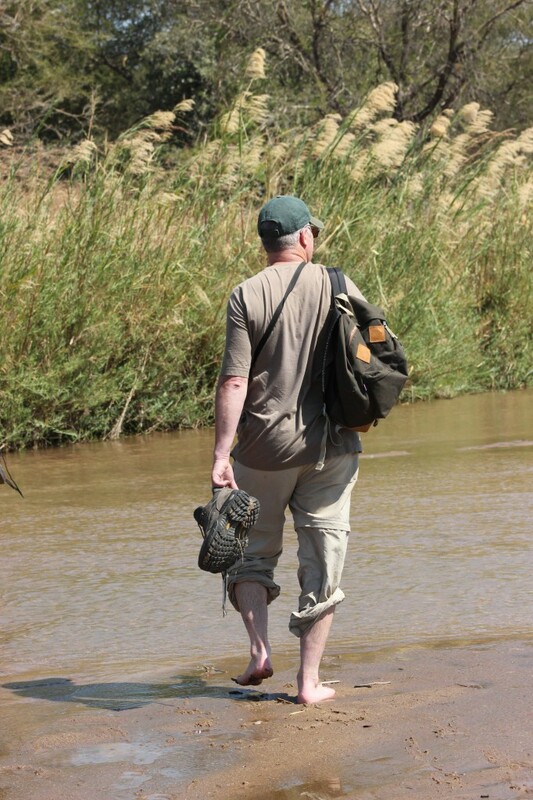 Crossing the Lubi river – completely dry sand at this time of year – we eventually arrive at the Mupamadzi river, the linchpin of our mobile safari. A light stroll that evening reveals a colony of matabele ants moving their nest (they hiss when approached), hundreds of funnel web spiders that can be tempted out of their nests by vibrating their webs, trees dropping lethally heavy two-foot sausage fruits, fish eagles lurking in trees, Bataleur eagles cruising the thermals, antelope-like puku in their thousands, elephants wreaking havoc in the mopane woodlands, and scores of birds from bee eaters to rollers. It’s a brilliant assault on the senses and a great lesson in all things natural. Mobile camp life has a simple rhythm: up at 5.30, wash by torchlight, toast or porridge from a charcoal brazier, watch the sun rise, walk for five hours, siesta till 3.30, walk again for a couple more, and return for a sundowner and dinner, usually in bed by 10pm. Averaging 10 miles a day keeps you fit. 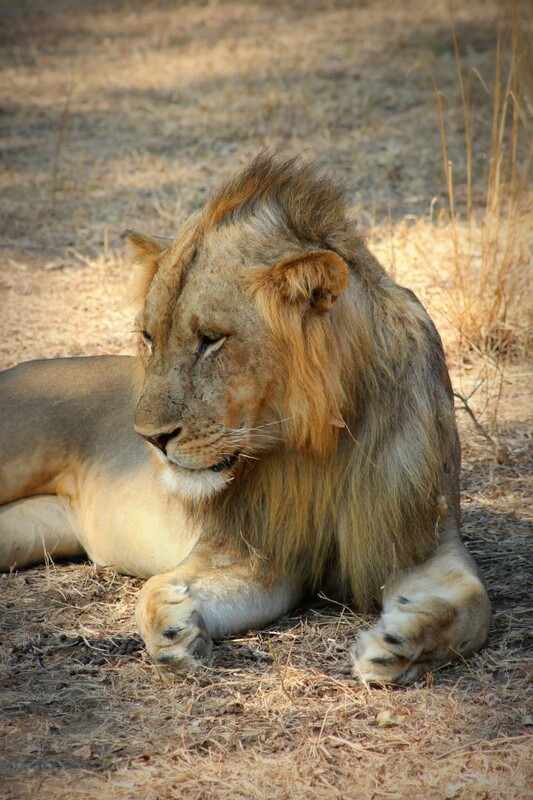 Our first full day out brings an amazing encounter – a lion and lioness on foot. The animals usually see you long before you see them, but the average flight distance is 500-1,000 yards, depending on how skittish the species is. It is crucial to let them know you are around so there are no surprises – a surprised animal is a dangerous one. 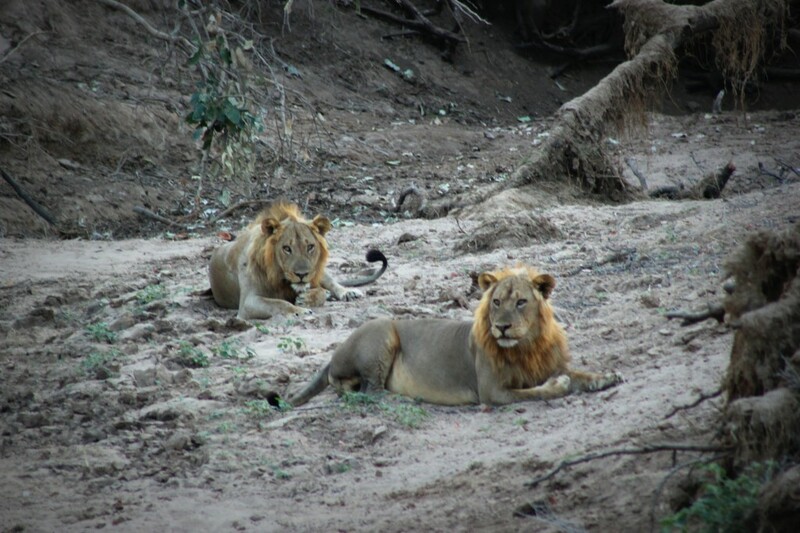 Having alerted the lions to our presence, they hide in a thicket, pottering about and unsure where to go. When the lioness growls a warning call we move on to examine a warthog kill, usually indicated by a swirl of descending vultures overhead. Everything is up for grabs round here. Take the spider-hunting wasp, which lands on the burrows of large baboon spiders, paralyses them and drags them off to their nest, cuts their legs off, lays her eggs, and allows her larvae to feast on the still-alive spider. Nice. After the afternoon walk, the gin van arrives, and we watch bats cavort at dusk, wary of the Bat Hawk that eats them, as cranes and ibises potter about in silhouette at the water’s edge. The next day is a full work out – ten miles over six hours – and we eventually wade the river back to camp. Dinner is interrupted to allow us to watch a huge honey badger foraging behind the kitchen area. The next day we have a more complicated encounter. Initially we are skirting the river when a puff of dust indicates movement. We catch sight of a lioness disturbing some zebra and elephant. We follow for a while when a commotion erupts in the opposite direction. A cacophony of baboon alarm calls announces the presence of a leopard, and after a sustained skirmish, the leopard is chased away by the baboon pack. We are so wrapped up in the scene that we almost forget the lioness behind us. She is smart – advancing to the scene of the noise, and searching for the leopard’s kill, even climbing a tree to investigate, but there’s nothing left of it but some impala fur. Further natural observations continue: huge dung beetles roll dung into balls, lay their eggs inside, roll them in sand and bury them. The resulting rock hard cricket balls are no match for the honey badger, who sniffs them out and cracks them open. We spend a lot of time investigating dung of all kinds. We find snakeskins. The nasty antlion – the larva of a dragonfly-like insect – lives in a small hole feeding off anything that drops in. We see warthog, puku, Bataleur and tawny eagles, buffalo in great herds, praying mantis nests (golfball-sized white constructions with the texture of prawn crackers), bats at night, roan antelope, and more. Night noises can be scary enough in the bush, but more so when you are sleeping in a tent. I wake with a start when a lion begins his guttural growl, convinced he is only feet away. 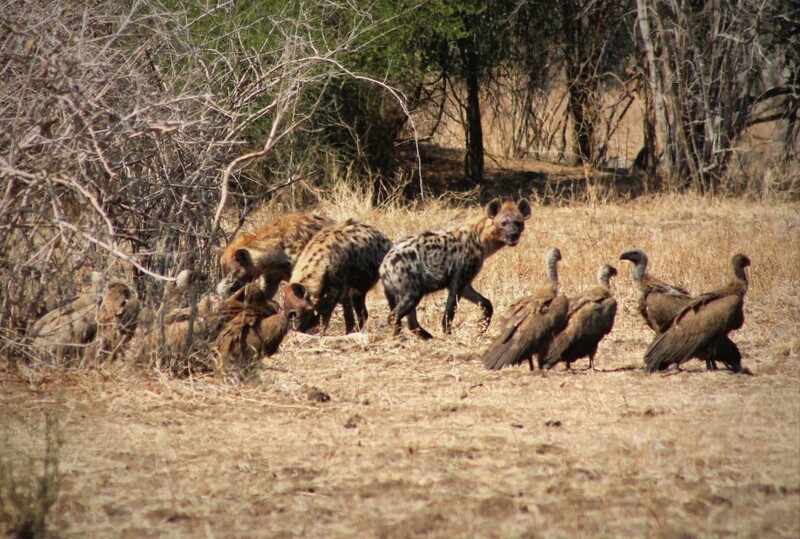 Hyenas howl and regularly visit camp, as do elephants knocking down trees and munching leaves incessantly. The next day we give a wide berth to a wounded lone buffalo. These are not surprisingly grumpy and dangerous, and we afford it the appropriate respect. Massive eland antelope, waterbuck, bushbuck and more cross our path before we are met by the team and treated to a full English breakfast in the middle of the bush. By now we have seen over 100 types of animal and bird. Driving back south we stop to see probably the world’s oldest and biggest baobab tree with a diameter of at least 20 feet, and an area the size of a house inside its hollow trunk. I tap the trunk and there is a strange rumbling noise from within so we retreat gracefully. On the road we nearly collide with a huge roan antelope traveling at speed. After a brief pit-stop at a picturesque lagoon surveyed by fish eagles and full of saddlebill storks, we cross the river by boat to arrive at Tena Tena camp. This means ‘temporary home’, but nobody knows which tena means which. 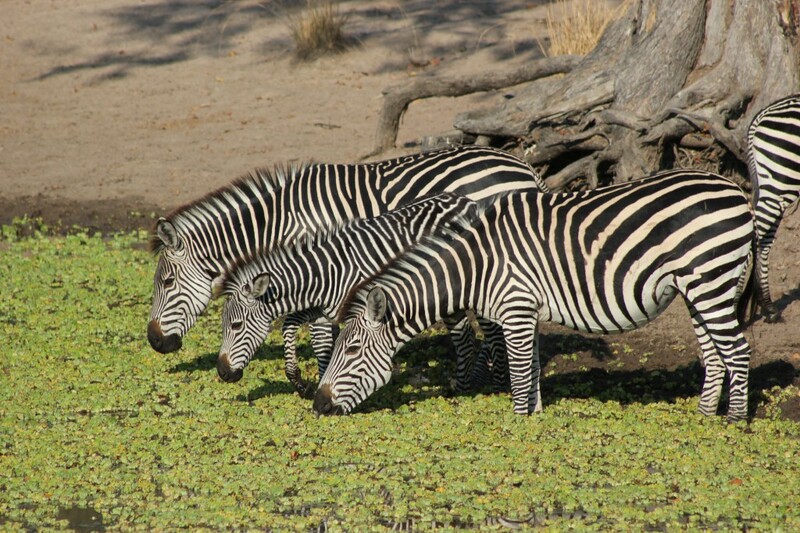 I subsequently discover that it is also the name of the Nile Cabbage vegetation that comes and goes in the lagoons. Amazingly, I have placed my binoculars on the front bumper of the jeep when picnicking at the lagoon. A bumpy few miles later they are still on there when we arrive at the river. The night drive is a packed one. We spot genet, civet, porcupine, massive Verreaux’s owls, the rare Pel’s fishing owl, white-tailed mongoose, and elephant shrew with ingenious routes through the bush – they clear stepping places so they can escape silently in a hurry with a sprightly bounce. Two male lions are sleeping contentedly in a gully. Both have reverse colouring, with dark bodies and honey-coloured manes. The wildlife keeps coming. 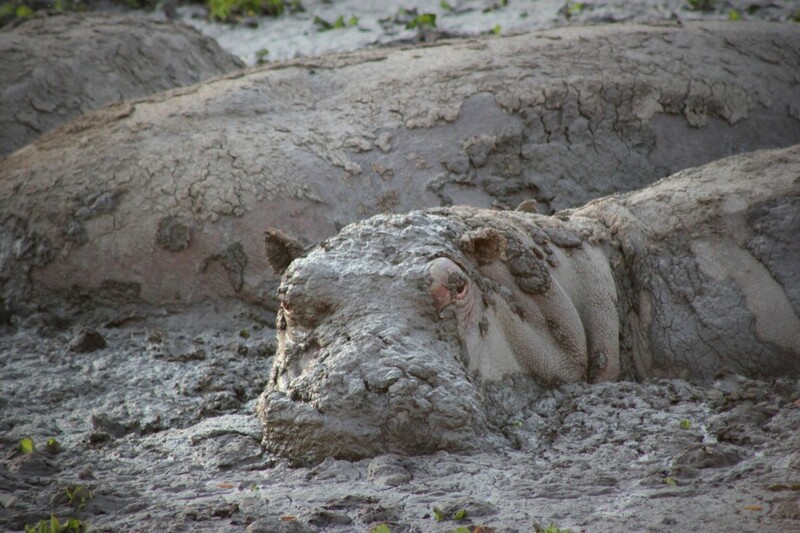 There are hippo and crocs everywhere. 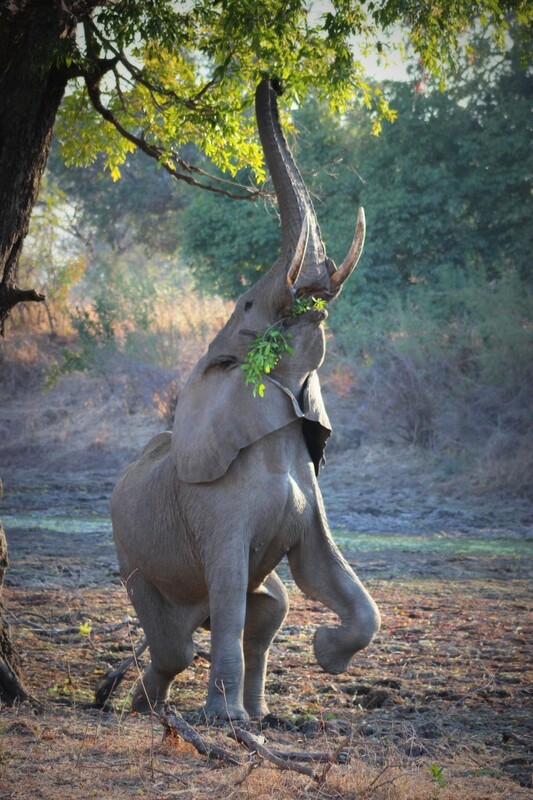 Elephants stretch for high acacia leaves. A harrier hawk systematically searches tree holes for prey. 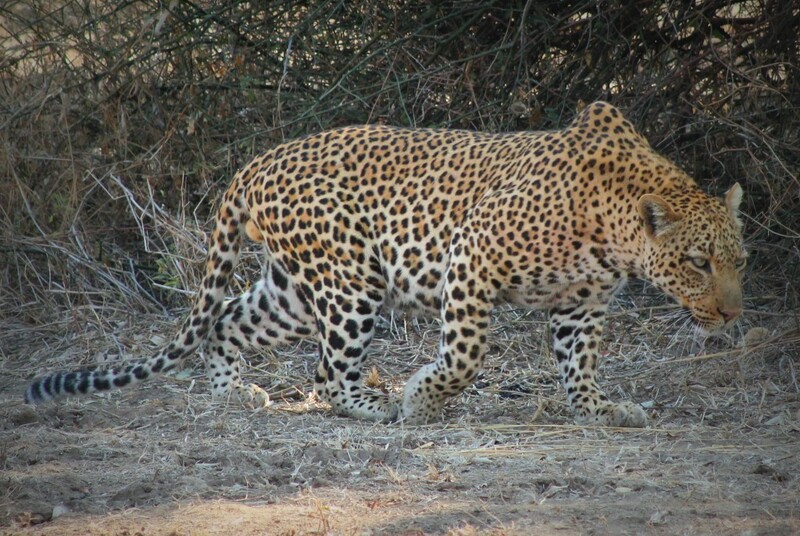 A huge male leopard lies fat and motionless after a large meal. A giraffe chases a hyena off the carcass of her baby as three others sneak in for a meal. Later after dark we trail one trotting off with the giraffe leg in its jaws. We encounter grumpy elephants with their trumpeting and mock charges. Baboons beat the crap out of each other and chase around. And then it’s back to camp for a well-earned Mosi beer, named after Mosi-oa-tunya – the smoke that thunders – otherwise known as Victoria Falls. The night drive is full of action. A genet conveniently waits stationary by the track and then leaps across it to kill a mouse. We follow a female leopard walking through the usual racket of a baboon alarm. And a hyena lopes nonchalantly along the road before sloping off into the bush. 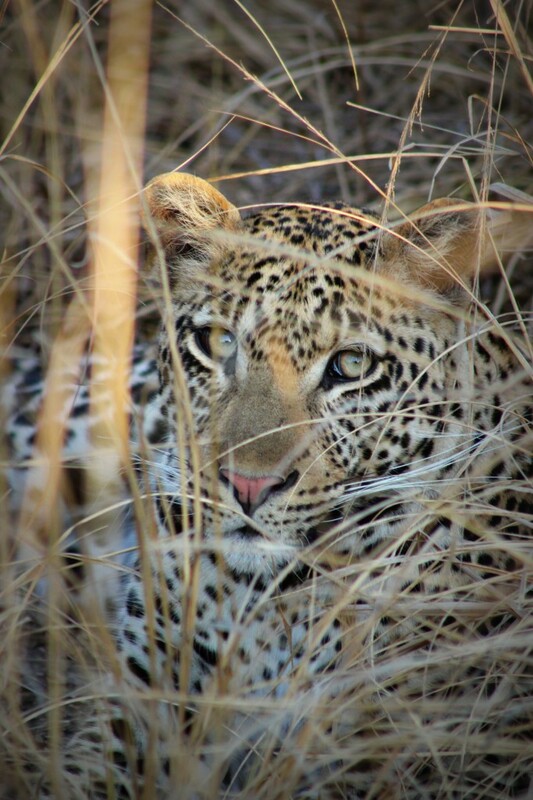 Our safari has been superb, and even as we drive to Mfuwe to catch the flight to Lusaka, a leopard cub peers at us from the side of the road before sprinting for cover. We have a connecting flight to Joburg, and the passengers are almost entirely members of a First Baptist Church from Texas wearing rather inappropriate and borderline aggressive religious t-shirts. In the main, their eyeballs point in different directions. We check in to the City Airport hotel for an overnight pit-stop before flying the next day to Pemba, on the north-east coast of Mozambique. Disgracefully, the man in front of me has a laptop screensaver with a picture of him holding a gun and grinning at the camera whilst leering over the body of a leopard he has shot. It comes as an unpleasant shock after ten brilliant days in the bush. Apart from this isolated idiot, Zambia comes highly recommended. It’s been emotional reading this … brilliant and the photos are amazing.